Deramakot Forest Reserve is the first natural tropical rainforest in South East East Asia managed in accordance with good forestry practices. 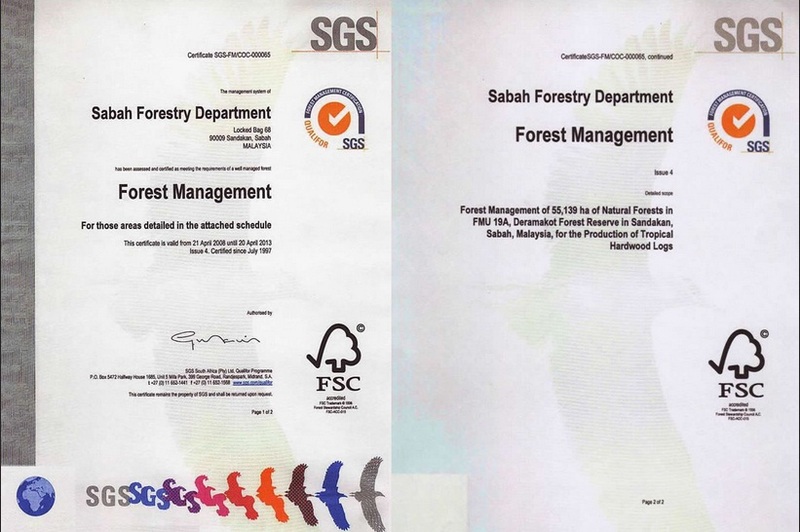 It was audited by SGS - Forestry Malaysia and certified in September 1997 as complying with the requirements of the Malaysian Criteria and Indicators (MC&I) for Natural Forest Management (NFM) and the Forest Stewardship Council'sTM (FSCTM) (FSCTM SGS-FM/COC-000065) Standards for Responsible Forest Management. Realising the reality of forest depletion, the Sabah Forestry Department with technical support from the German Agency for Technical Cooperation (GTZ) of Germany, have developed a management system aimed at responsible production of timber for logged over forestlands in 1989. The system requires substantial investments in forest planning, infrastructure, low impact harvesting equipment, and training of foresters, managers and forest workers in new techniques. The objective is to begin with the application of ecologically and scientifically acceptable forest management to the logged-over Commercial Forest Reserves of Sabah. The intent is to manage the commercial forest reserves in a way that mimics natural processes for production of low volume, high quality, high priced timber products in a sustainable manner. Sustainability is defined in terms of balance nutrient cycles, forest structure, biodiversity, forest function and socio-economic needs. Deramakot FR was chosen as the model forest for best forest management practices. Deramakot Forest Reserve is 55,139 hectares of Mixed Dipterocarp Forest. The forest had been logged at least once with subsequent silvicultural treatment (i.e. poison girdling) before the commencement of the project. Past forest management practices have resulted in a very heterogeneous stand types and a patchwork of different stocking conditions. Only 20% of the area is considered well stocked and more than 30% is covered by very poor forest with virtually no mature growing stock left. Apart from some small human settlements that are located at the fringes of the Reserve, the entire forest area is uninhabited. These have made Deramakot an ideal site as the model forest to demonstrate the best forest management practices before expanding the concept to other forest reserves in Sabah. As dictated by the 2nd Forest Management Plan (planning period: 2005 - 2014), 51,642 ha of the area is set aside for log production and 3,423 ha for conservation and the remaining 18 ha under community forestry.